Nhanh tay đặt ngay trước khi quá muộn! Bạn có thắc mắc về New Siam Riverside à? Nằm ở vị trí thuận lợi thuộc Bangkok, New Siam Riverside là một nơi nghỉ chân tuyệt vời để tiếp tục khám phá thành phố sôi động. Từ đây, khách có thể dễ dàng tiếp cận được nét đẹp sống động của thành phố ở mọi góc cạnh. Với vị trí thuận lợi, khách sạn dễ dàng tiếp cận những điểm tham quan du lịch nổi tiếng của thành phố. New Siam Riverside mang lại dịch vụ hoàn hảo, làm hài lòng cả những vị khách khó tính nhất với những tiện nghi sang trọng tuyệt vời. Miễn phí wifi tất cả các phòng, quầy lễ tân 24 giờ, tiện nghi cho người khuyết tật, giữ hành lý, wifi công cộng chỉ là một vài trong số những thiết bị được lắp đặt tại New Siam Riverside ngoài một số khách sạn khác trong thành phố. Hãy trải nghiệm qua các thiết bị phòng chất lượng cao cấp trong suốt thời gian bạn lưu lại. Một số phòng được trang bị internet không dây, internet không dây (miễn phí), máy điều hòa, tivi, tủ lạnh, giúp cho bạn phục hồi sức khỏe sau một ngày dài. hồ bơi ngoài trời của khách sạn là nơi lý tưởng để thư giãn và đổi gió sau một ngày bận rộn. Dù cho lý do của bạn khi tham quan Bangkok là gì đi nữa, New Siam Riverside là một nơi tuyệt vời cho chuyến nghỉ mát vui vẻ và thú vị. A very comfortable, friendly, mid-range hotel. The riverside view was excellent — well worth being a bit removed from metro and sky-train service — and there are always the river ferries. Very pleasant pool and dining areas; breakfast was quite good, and the pad thai I tried one evening was good and reasonably priced. Friendly, helpful staff. Hotel was good! Rooms was basic, but clean. Staff was friendy. Buffet breakfast included toast, eggs, ham, sausage, fruits, coffee, juice, etc. The hotel location was excellent. Just 5 min walk to Ram Butri-road where you can find lots of cheap places where to eat. If you don’t want use expensive taxis or tuktuk, you can use local busses! Bus-stop is just next to hotel and bus no 15 goes to Siam- BTS station. Value for the money, such as nice location, sweet staffs. But there was a little bit annoying for me, as the room was not that soundproof. Luckily, the tourists who were living in the next room were quite understanding. We liked the breakfast, right at the river. The pool was OK too. Too bad, they closed it too early. Rooms were a bit "old" and didn´t really smell nice, but good enough for the price. I would choose this hotel again. Clean hotel and nice location. Staff spoke English and were helpful. Good buffet breakfast. The New Siam Riverside is beautifully situated by the river - a great outlook, and ideal for getting to main tourist areas by water rather than congested roads. The rooms are quite small and a little tired, but have all the facilities one could wish, although the quality of the Internet seems to vary depending on the location of the room. Breakfasts are very good. 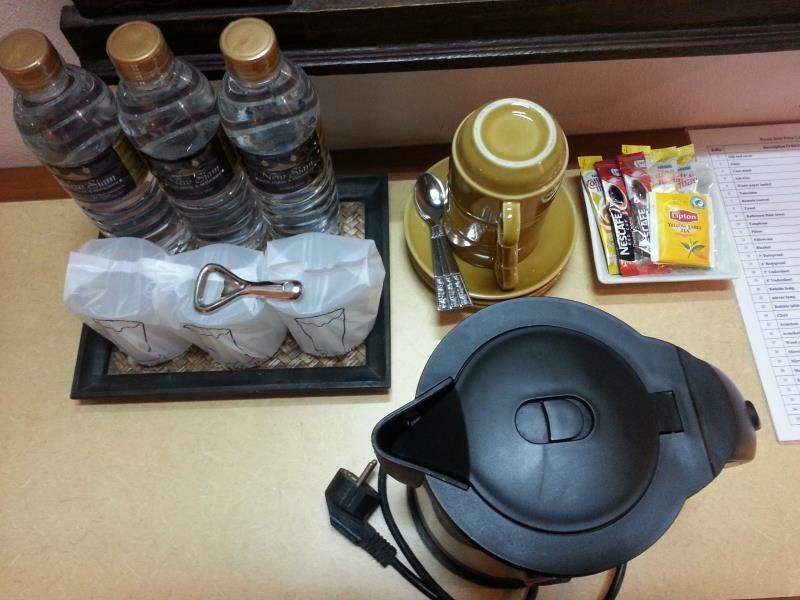 The place is safe, clean and comfortable, and the staff friendly and helpful. While we were there, the swimming pool was unfit for use as there were problems with water quality - this was a real disappointment, as the pool area is a nice relaxation spot. However, maintenance had been done when we left, and the water was clean again. Lots of restaurants and lively night life are available in the Khao San road. We would stay there again. Loved our stay and will definitely go back! We had a room with balcony overlooking the river and our daughter shared a triple with friends. The rooms were equally fine but our view was amazing and the view from our daughter’s room was of the central void so not great. I guess you get what you pay for! 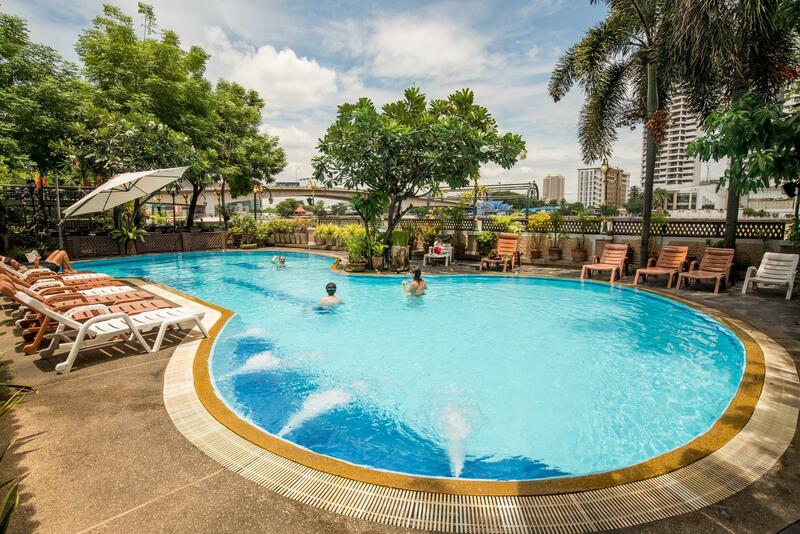 The hotel is in a great location within a short walk of the fab Khaosan Road area and the Grand Palace. Breakfast was fine but all food could do with being covered as there were lots of small flies around the fruit. At checkin we had a few problems as we’d booked a room with 3 beds for the kids and we were allocated a double bed and a single which wasn’t what we wanted and we had to stand our ground and make a bit of a fuss to get what we’d reserved, but otherwise the service was good. All in all we recommend this hotel as it’s a very good mid-price option. Good location, the rooms are dated but clean enough. Nice breakfast outside on the riverside. I have been in this hotel perhaps 15 times. Except 2 years ago when it was given to me a very bad room, I have always been very satisfied with this hotel : good staff, good breakfast, good deal according quality and price, nice small pool along the Chao Prao, and very close to Rambutri and Khao San Road. The public boats are also very close, and around you have a good choice of restaurants and bars. Pros: breakfast included, comfy bed and next to phra arthit Pier for access to Ferrys. Cons: shower looked like it hadn't been cleaned and bathroom was basic. Pool looked murky and gross even after having watched them clean it. If you just want basics of sleep sure but think it was pricey for what it was. Friendly staff. Good location and relatively quiet. Swimmingpool not clean. We came partly for the pool, bit didn’t want to swim in it. Room old and muffy. For the same money you can have a better hotel I think. Great location and perfect hotel. Tidy, clean, friendly staff. I have stayed their by myself and with my family- either way perfect. Great location, wonderful breakfast buffet and clean. We have stayed here before and returned to New Siam Riverside to kick off our Tha Land trip to the Andaman Sea this year. 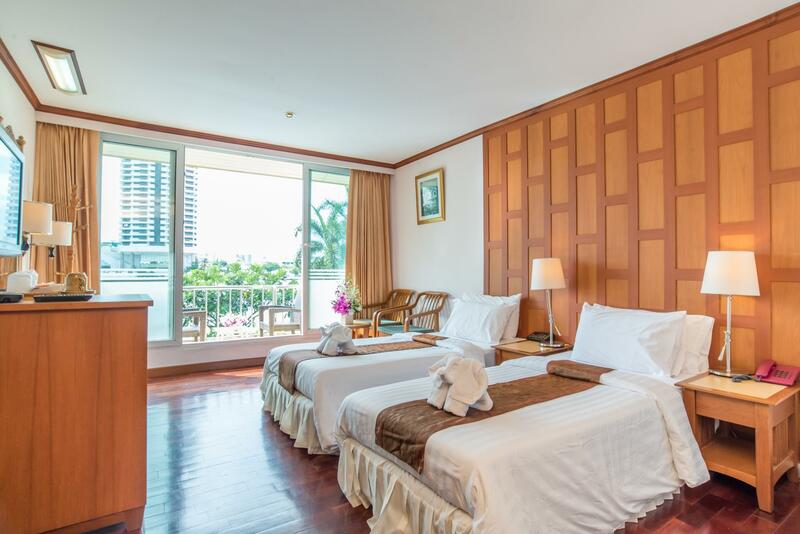 We really like this hotel because of its lovely location right on the river with easy access to the Chao Praya river express boat and not too far to Khao San and Rambuttri Road. The only downside is this time we had to wait until after 3:30 pm to be able to check into our room which we booked in advance. We arrived at the hotel around 1 pm and we quite exhausted from 28 hrs of traveling so it was a little cumbersome as they first told us 2:30pm which then turned into past 3:30 pm (we had requested an earlier check in which the hotel obviously wasn’t able to accommodate). But this was the first time this happened after having stayed here two or three times before in past years. So not a huge deal... just an inconvenience, really. Very appreciate on staff service mind and hospitality. You may ask to upgrade from the only river view on your book ing to better room with balcony at approx +20% charge, where you may have plenty of space at balcony:- private dining and smoking area. The staff are very helpful and taking care of you. However, some facilities quite old fashioned sush as the quite small bathroom and the fridge. I face some issues on ants and mosquitoes. Somehow, with this price you can afford than the other in the area. This hotel will be the one of the top list, if I have to stay in that area. New Siam Riverside is my favorite place to stay in the Royal Palace /Khaosan Road area. Walking distance to many places, it is easy to get to being located adjacent to the river and ferry system. Clean rooms and friendly, helpful staff. Restaurant and bar offer a variety of options.